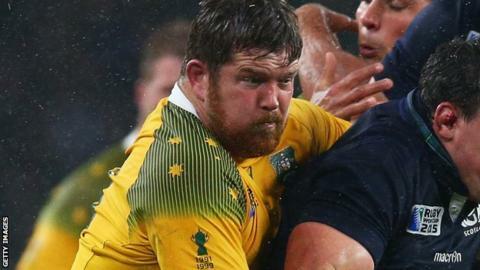 Exeter have signed Queensland Reds' Australia prop Greg Holmes on a two-year contract from the summer of 2016. The 32-year-old has spent his entire career at the Australian Super Rugby franchise, playing 132 times for the club in 10 years. He has won 24 caps for his country, the last of them coming in October's World Cup final loss to New Zealand. Holmes is the first new signing that Exeter have made for next season. "We watched a lot of his games for Queensland and the games he featured for Australia in the Rugby World Cup and anyone who looked at Australia's scrum will see they were one of the most destructive units in the tournament and Greg played a large part in that," Exeter boss Rob Baxter said. "Since then I have looked at a lot of his games and he looks like a guy who has a lot left in the tank and he's running around playing a lot of good rugby. "We're big believers here at the club of developing young English players, but I've said before part of the way you develop those young players is with the people who they meet and the people they have time with. "There is no doubt our other front-rowers will benefit from having Greg around, but at the same time he's very determined to be successful in his own right," Baxter added.